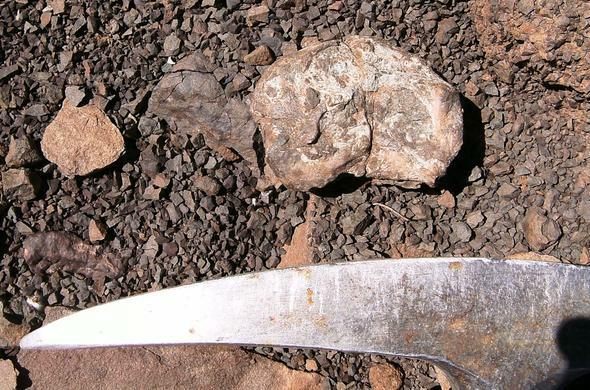 Small Diictodon skull found by Palaeontologist Marc Van Den Brandt. South African National Parks and Nature Reserves make excellent bases for fossil walks, tours and investigations. Any way you look at it, South Africa is at the forefront of important fossil finds, there are fascinating sites everywhere. Here is a brief guide on which park or reserve to visit for interesting fossil activities. This beautiful national park is situated in Langebaan, which is just over an hour's drive from Cape Town in the Western Cape. Top attractions include Wild Flower displays in season, seascape views, walks, hikes and trails, lagoon water sports and great birding. Geelbek is the site where what is known as Eve's Footprint was found on the shores of the lagoon. The fossilized footprints are currently in a museum in Cape Town, but a replica can be seen in Geelbek. The footprints have been dated to about 117 000 years old (the oldest example of a modern human to date). On the other side of the West Coast highway is the West Coast Fossil Park where you can see excavations in progress and fossils of amazing animals which roamed the West Coast around 5 million years ago such as Sabre-tooth cats, Bears and strangely - Short-necked Giraffes! This is a park for the whole family and also students, with lots to see and do. This reserve is adjacent to the West Coast National Park in Langebaan (see above). Top attractions include nature drives, Wild Flowers in season, scenic flights and Quad Bike Fossil Safaris. The Fossil Safaris take you to the white sand dunes of Elandsfontein where the remains of humans and animals can be seen. The oldest fossils date back about 800 000 years. Situated in the ancient Great Karoo, this national park is just off the N1 highway near Beaufort West in the Western Cape. Top attractions include day and night guided game drives, hikes, walks and trails, birding and scenic landmarks. The Fossil Trail is universally accessible and about 400 metres (0.2 miles) long. The trail highlights the unrivalled importance of the Great Karoo as a fossil deposit and you can see examples along the route. This luxurious private reserve near Graaff-Reinet is about 3 hours drive from Port Elizabeth in the Eastern Cape. Top attractions include guided game drives, bush walks, Cheetah tracking and an Anglo Boer War site. This reserve is in the ancient Great Karoo, a world renowned fossil deposit and local tours to pre-historic fossil trails and bone collections can be arranged. Characterised by its golden sandstone cliffs, unusual scenery and ancient geology, this national park is located close to the town of Clarens in the Free State Province. Top attractions include Cathedral Cave, a Basotho Cultural Village and Museum, an historic gravesite, birding, outdoor sports, horse riding, hikes, walks and trails and scenic landmarks. Primitive tools and rock art have been found here as well as fossilised dinosaur bones, footprints, ferns and roots. Dinosaur eggs were unearthed at Rooi Draai in 1973 and now again more nesting sites with eggs have been discovered and these are the oldest yet at 190 million years! This nature reserve is part of the Cradle of Humankind (Maropeng) a World Heritage Site, close to Pretoria and Johannesburg in the Gauteng Province. Top attractions include day and night guided game drives, horse trails, wildlife displays, also abseiling and cave excursions. The Cradle of Humankind is an award-winning interpretive centre with interactive displays and intriguing fossils - some tools are about a million years old! The Sterkfontein Caves are also part of this exciting visitor site.